I have checked the results from the ‘apples to apples’ paper (see discussion here) by downloading the Python software and most of the CMIP5 model results thanks to Kevin Cowtan. The main conclusion of the paper is that there is a small bias whereby models slightly overestimate the surface warming when comparing to Hadcrut4.4. The reason for this is a small difference between sea surface temperatures (as measured by HADSST3) and surface (2m) air temperatures over oceans. Surface temperatures tend to be slightly cooler than air temperatures. Possible reasons for this are latent heat loss from the surface and heat flow to the abyss from the mixed layer. I have checked the calculations and my conclusion is that the code is good and the published result is sound. However it remains a rather small effect of just -0.05C ‘bias’ when comparing Hadcrut4.4 in 2015. This is still within measurement errors. 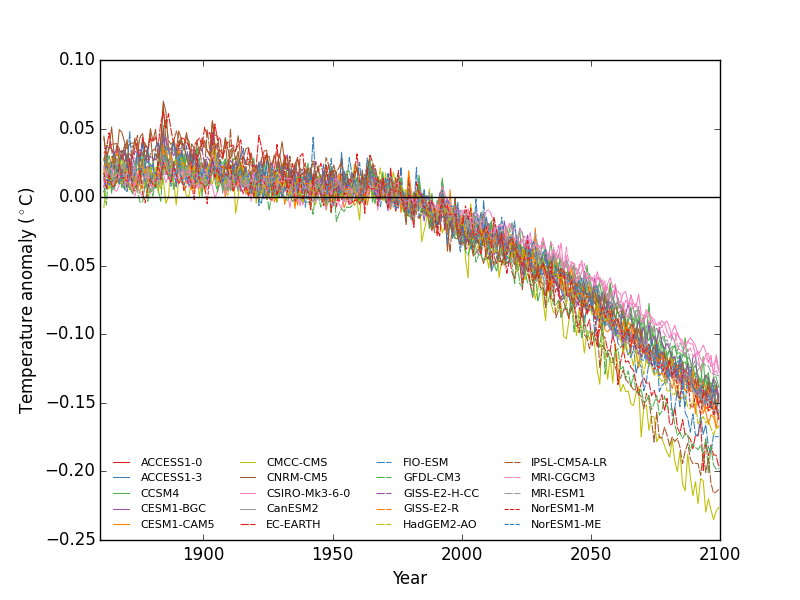 The blue curve is the average of 6 CMIP5 model results for the global temperature anomaly. The red curve is the blended result corresponding to Hadcrut4. The bias grows to around -0.2C if, as predicted by models, temperatures rise by ~4C by 2100, which then becomes significant. It turns out that the net bias is simply proportional to the net warming relative to 1961-1990, and therefore remains at a constant 7% of the temperature anomaly. This also explains why the bias is positive before 1970. Bias in CMIP5 model blending up to 2100. 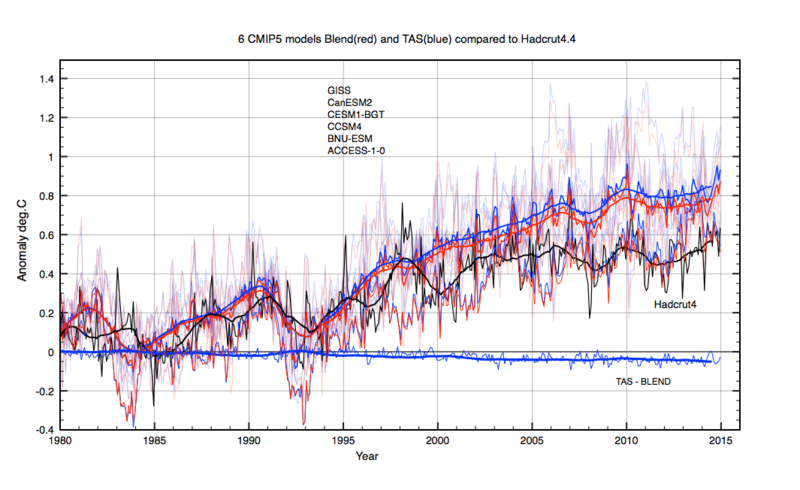 Note that this bias is a model only effect which does not change the measured Hadcrut4.4 surface temperature measurements. It also includes a modelled sea ice melt change which only really makes sense if future HadSST measurements extend into such areas. Thanks to Kevin Cowtan for providing the data. I was able to download the majority of the CMIP5 results while travelling around Australia. I have about 31 model runs which will be helpful for future comparisons. This entry was posted in AGW, Climate Change, climate science, GCM, Institiutions, IPCC, Science and tagged Climate Change. Bookmark the permalink. Although I found the discussion here and at CLB very interesting, the Apples to Apples paper is about shimming the ship’s deck chairs for plum after colliding with an iceberg. Naturally people are also concerned about checking things out below deck. I agree. There has been too much importance given to what is essentially a minor correction to model results. I just wanted to check out the result as it is the latest in a whole string of papers that try to portray the hiatus in warming as irrelevant. 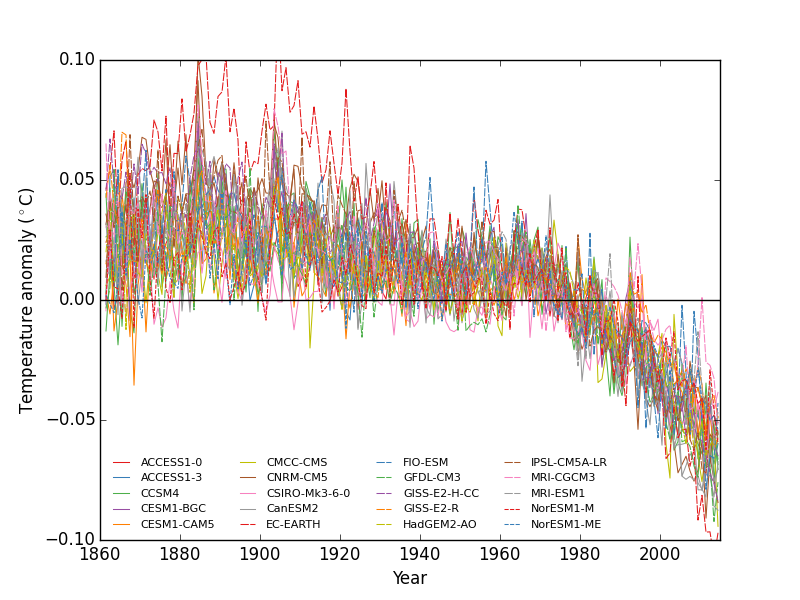 It isn’t irrelevant because it points to a climate sensitivity at the lower end of the scale and that is good news. Clive, I notice that UAH and RSS are converging here while both diverging from HADCRUT4 and even HADCRUT3. So I suppose part of the divergence is Cowtan and Way(2013) adjustment in polar temps in HC4 that do not show up in RSS and UAH, which don’t cover poles. Do polar temps account for all the divergence? If so, would you agree its mainly Arctic? Or is it something else? On the hiatus, I agree it is not a full pause. And, I agree that we could be in a natural PMO/AMO 20-year cooling cycle masking some radiative warming. I even agree that the bucket sampling of oceans for SST was crude. But to believe that all biases are always in one direction and need to be adjusted in support of AGW gets silly at some point. Clive, are you aware of any studies of ocean temp/land temp interaction, perhaps for sake of model coupling or to study marine climates? There is a difference in normalisation which you have to allways be careful of. Hadcrut4 ‘anomalies’ are relative to 1961-1990. UA3 and RSS are relative to 1981 – 2010. GISS is relative to 1971-2000. That explains T shifts but i doesn’t explain any different trends. I hope Hadrcut4.4 has not included Cowtan and Way corrections in the Arctic as that would be scientific fraud. It is very important to always separate actual measurement from model expectation. You’re right. When normalized they are much closer. But they are still have some different trends, especially GISTemp. Hi Clive, thank you, this is very helpful.